I am crazy, an over the top dog lover. I share cute dog videos on Facebook. I also share pleas for the endless number of rescue dogs who are in dire circumstances and really need rescuing. 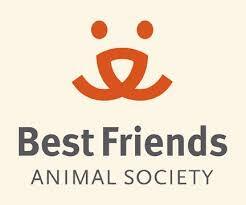 I donate money to all kinds of dog rescue organizations as well as the Humane Society. One of my favorite Rescue Groups. My heart breaks for all the dogs out there who are abandoned, neglected and/or abused. I try to read as little as possible about dogs suffering all over the world because their images haunt me and keep me from sleeping. Sometimes my heart actually hurts just thinking about them. Then I read a feel-good dog story and I jump up and down with glee. The positive piece that recently caught my attention was in the New York Times on August 7. 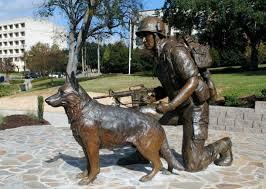 Written by Sean Piccoti, it’s called “A Military Medal For ‘Our Four-Legged Heroes’”. The article is primarily about the legislation that has just created a ‘Guardians of America’s Freedom Medal’, the first official commendation by the Defense Department for military working dogs. 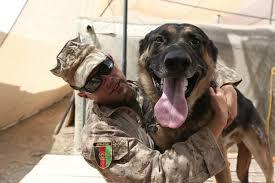 Close to 3000 military dogs and handlers are stationed around the world, especially in the Middle East. All branches of the military use dogs who are trained in bomb and drug detection. Dogs are also trained to scout, guard, and track. Also to sniff out bombs, booby traps, mines, drugs, and hostile forces. They are used to patrol Air Bases, Military Compounds, Ammunition Depots, and Military Checkpoints. The dogs often do multiple tours of duty, like their humans. Some lose their lives, and some lose limbs or suffer other debilitating injuries, just like human soldiers do. Until now, the dogs and their handlers were not recognized for the amazing jobs they do. The story goes beyond the military award and the recognition of the dogs’ service. 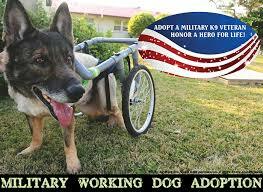 The article also talks about a wonderful organization called The War Dogs Association. This New Jersey-based organization provides essential services for the military dogs and handlers on active duty as well as after retirement. The War Dogs Association donates badly needed supplies to active duty dogs. Ron Aiello, the President of War Dogs, says that if an active duty handler needs a new harness for his dog, it can take months to get it from the army. War Dogs can respond to an email request immediately and get the harness delivered within a week! The dogs also need other equipment that the military doesn’t always provide. For example, War Dogs sends special goggles to protect the dogs’ eyes from sandstorms. They send cooling vests to protect the dogs from the over 100-degree temperatures in the Middle East. They also send dog boots to protect the dogs’ paws from injury due to extreme heat and rough terrain. It’s appalling to me that the military doesn’t protect their dogs in these basic ways! War Dogs also takes care of retired dogs. They find good adoptive homes for them when they come back to the States. They also pay for medical care for the retirees, including a free canine prescription drug program. This story is particularly encouraging because, during the Vietnam war, military dogs were regarded as ‘equipment.’ Many dogs who served were euthanized or just given to the Vietnamese when they were no longer needed. Even today, I’ve read that handlers who want to adopt their service dogs when they retire, have to jump through hoops to make it happen. They have to pay lots of money and often wait years to go through the red tape necessary to get the dogs released to them and eventually shipped to America. It should be automatic that dogs and handlers be kept together if that’s what the handler wants. Hopefully, War Dogs will help with this problem as well. Here is a link to the War Dogs Association: https://www.uswardogs.org. Please donate something. Absolutely! It’s time these amazing animals get the recognition they deserve. I imagine that the bond between dog and handler must be very strong so the military should make it easy for them to adopt them. I am horrified that they don’t supply essential equipment for the dogs welfare so it’s great that these societies step in to help. I am horrified too that basic safety equipment is not provided to these dogs. Also, that it is not an easy and automatic thing that the handler gets to keep the dog onced he or she retires. Why are we always so callous and uncaring as a society? You’d think that more humanity would be employed when it relates to man’s best friend. Apparently not! I might actually find this interesting. Many people have suggested we need at least one larger dog because between the bears and coyotes, it’s getting a little wild around here! Ellin,a wonderful post. I saw some truly horrific scenes involving service dogs during my Vietnam tenure as a reporter. Too urgly to share. I can’t stand hearing about the horrible things that happen to these service dogs in the line of duty. Sorry you had to actually see them in person, Garry! You must have nightmares about what you saw.Especially since you’re such a dog lover. 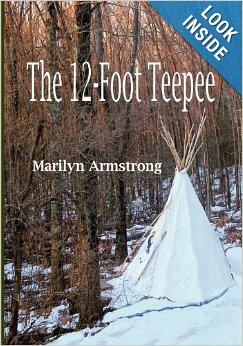 That’s a great idea, Marilyn! These dogs are so magnificently trained! And they all have been well bonded to people and to other dogs. A retired service dog might be perfect for you! It figures that dogs, with their keen sense of smell, would be good at this Ellin. These dogs can do amazing things with their sense of smell. I’ve seen domonstrations where they can sniff out a tiny quantity of drugs in a huge bag of coffee, or find the one suitcase out of hundreds that has the drugs. I think some are being trained to sniff out cancer etc. They can be more accurate than conventional testing. The huge dogs we see — all the big guardian and mastiff breeds — were originally war dogs. Mastiff, Bull Mastiff, St. Bernards, Great Pyranees, the big Swiss dogs (there are quite a few an I always forget their names, but they all look a lot alike), Dobermans, Boxers … and I can’t name them all were originally fighters. They have, through the centuries, been tamed down to become protectors and they are very good at it. They seem to have some kind of built-in understanding of danger. I grew up with Dobermans and they were SO protective! Dogs trained for war also have to be totally bonded to their humans, very smart and very obedient. All great qualities for a pets. You’re right – dogs have been used for was forever. 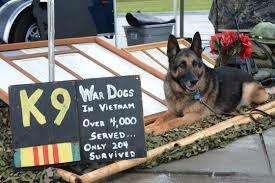 I read about war dogs in WWI who did pretty much what they did in Vietnam. I can’t believe that those dogs are not GLADLY given to their ‘handlers’ once they retire. This behaviour seems absolutely atrocious and is utterly inhumane. Knowing the intimate bond between a dog and its human, it would surely only help both, the man/woman and the animal to be together for the rest of their lives.